* Real Science Radio Interviews Bible College President: Bob Enyart of Real Science Radio interviews Don Landis on his book The Genius of Ancient Man which contrasts the evolutionary paradigm of grunting cavemen with the actual widespread historical, anthropological, and archaeological evidence of a brilliant and sophisticated ancient human civilization. * The Argument is Genius: Don Landis, college president and chairman of the board for Answers in Genesis, celebrates with his new book the brilliance and astute astronomical insights of ancient civilizations. "All over the world there are similar findings of world travel, advanced astronomy… ancient man had the advanced knowledge of astronomical movements, including the process of precession …found everywhere," Landis writes. For example, Roman sailors used an Antikythera mechanism with dozens of gears to track the Sun, Moon and planets. * What's the Point? Darwinism implies that anciently men were less intelligent than today. Creationism informs millions that they were more brilliant than we are. As always, the evidence supports creation. - ANCIENT "CAVEMAN" ANIMATION: Really! 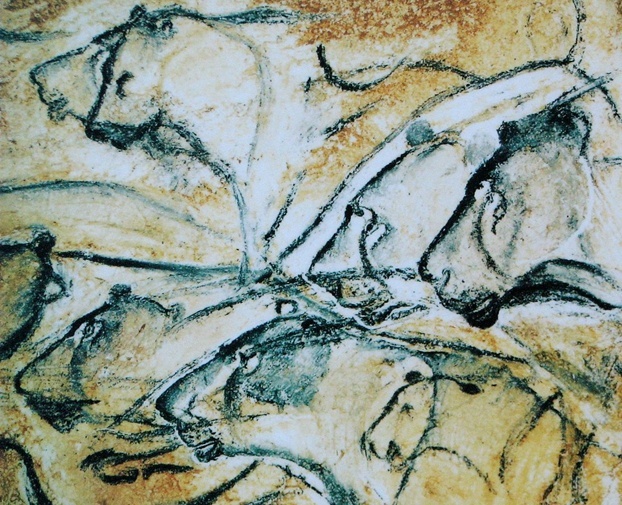 Allegedly 30,000-year old cave drawings depict a series of animal-movement animations that would be surreal to ancient visitors seeing the cave by torchlight. See this in the Spring 2015 issue of Creation magazine and in journal Antiquity, and at discover.com! * 2400 B.C. Sumerian Calligraphy: Early writing, as on the Barton Cylinder describing the Sumerian creation myth, was not merely functional but "a beautiful example of Early Dynastic calligraphy" from 4,400 years ago. * 2000 B.C. Period Of Mercury's Orbit Known: A paper published in the Quarterly Journal of the Royal Astronomical Society argues from evidence that astronomers in India obtained the period of Mercury in the 3rd millennium B.C. * Babylon Beat Pythagoras by a Thousand Years: Consistent with the increasingly acknowledged genius of ancient man, consider from the University of St. Andrews in the UK that a thousand years before Pythagoras, the Babylonians knew the "Pythagorean" Theorem. * Babylonian Trigonometry Beat the Greeks by 1500 Years: As referenced in Science, the prestigious journal Historia Mathematica reports that, "The Babylonians discovered exact sexagesimal trigonometry at least 1500 years before the ancient Greeks discovered trigonometry." See also rsr.org/60, rsr.org/360, and 360dayyear.com. * Calculus and Brilliance in Babylon: The city of Babel was built by Noah's great-grandson Nimrod in what today is southern Iraq. Eventually, one of the earliest identifiable people groups, the Sumerians, occupied this region of the Middle East. Their land and culture was later absorbed into the Babylonian Empire. (The initial Babylonian Empire flourished in the second millennium B.C. a thousand years before Nebuchadnezzar and the other kings of the later revived Neo-Babylonian Empire.) A 2016 paper in the journal Science, Ancient Babylonian astronomers calculated Jupiter’s position from the area under a time-velocity graph, describes the Neo-Babylonian use of a rudimentary calculus a millennium and a half before such calculations were thought to previously have been discovered. Commenting on the paper, Caltech's Noel Swerdlow said of the Babylonians, "They were very, very smart, and the more we learn of what they did, the more impressive, the more remarkable it becomes." And New York University's Alexander Jones added that their work, "testifies to the revolutionary brilliance of the unknown Mesopotamian scholars who constructed Babylonian mathematical astronomy." - HUMAN IQ HIGHER IN NEANDERTHALS: As we've reported at rsr.org/neanderthal, these Ice Age people were not another species but they are human beings (Homo sapiens), as confirmed by analysis of their speech apparatus, that they took aspirin and Penicillin, and that their sequenced genome shows that the Neanderthal were genetically closer to you, the reader, than a chimp is to another chimp. Further, as we reported in 2014, creationist work "suggests that today's Homo sapiens age much more quickly than did human beings from a few millennia ago." Three years later, in September 2017, the journal Science reported that while today spinal "bones tend to fuse by the time children reach the age of six", for a 7-year-old Neanderthal, "the small bones forming the boy's backbone were not fused." And by the time a modern child's brain reaches "95% the size of an adult's", unlike fast growing ape brains, the Neanderthal's brain has only reached "87.5% of the size of an average adult Neanderthal". While creationists expect this, to evolutionists like the team lead Antonio Rosas, "It was a surprise." Why a surprise? Partly because their evolutionary worldview misdirects them into assuming that Neanderthals were closer to an ape-like ancestor than we are. Ape brains mature quickly. Consider that our children need us parents for many years, which is one of the blessings God gave to us. In fact, the human body is the slowest of all organisms to mature. (A woman doesn't fully physically mature at the end of puberty but when she has given birth to her first child.) So, as reported by the BBC on this 2017 discovery, "The finding raises the intriguing possibility that the Neanderthals' slightly slower brain development meant that their brains might have been more advanced than ours." - the precession of the equinoxes. 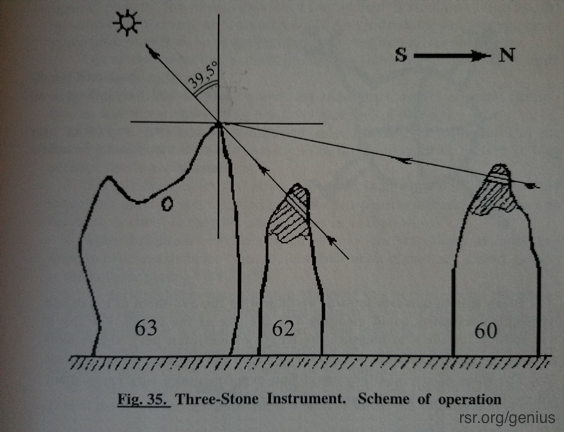 Herouni, an accomplished scientist in radar, radiophysics, radioastronomy, and antenna metrology with hundreds of published papers, estimated the accuracy that ancient Armenians could obtain with their astronomical stones for such measurements, including for example knowing during the spring equinox the moment of noon to within two seconds. 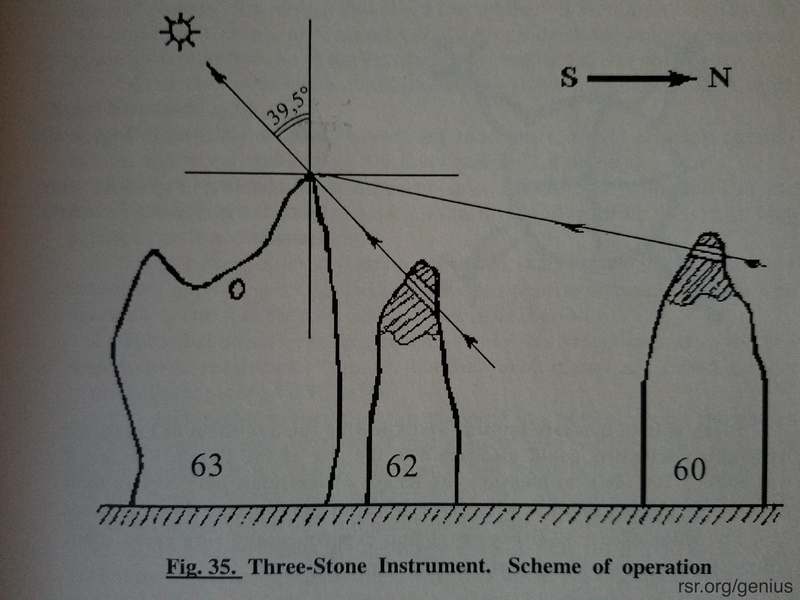 And regarding latitude, Herouni reported (p. 49) that in the third millennium BC, the ancient Armenians knew their 40 degrees north latitude to within half a degree. * Prof. Hawkins to Herouni on his Carahunge Work: "I am most impressed with the careful work you have done, and hope that the result will ultimately get recorded in the literature. The menhir-lined Avenue [menhir refers to tall, upright stones erected in ancient times] leading from the stone circle is similar to the Avenue at Stonehenge, and the Avenue at Callanish. The former points to the midsummer sunrise, and the latter to the extreme point of the setting of the moon. Both date to the third millennium BC. At Carahunge the arrangement is similar. The Avenue from the stone circle points to the extreme northerly rising of the moon in the third millennium BC. As [with] Stonehenge and Callanish, the Avenue is the most distinctive architectural feature of the monument." May 18, 1999, published by permission. * Stonehenge & Carahunge: Dr. Paris Herouni argues that like other "henges" in Europe, the meaning of both monuments is "Speaking Stones", with the Armenian car meaning stone, and hunge (hunch) meaning sound, echo, or voice. 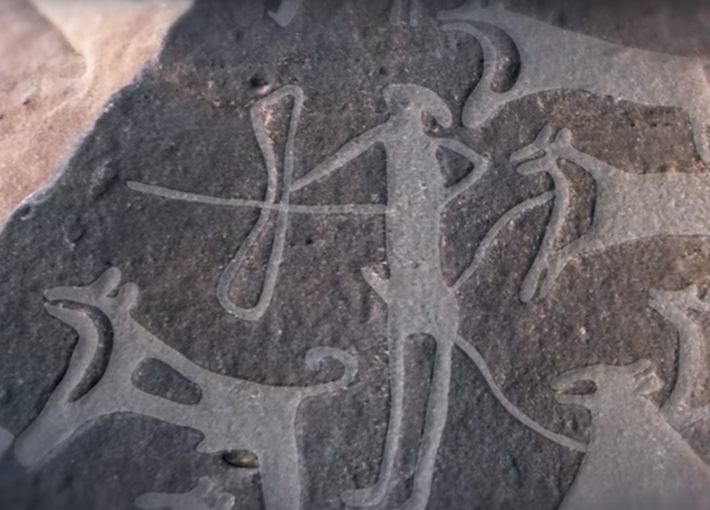 If so, as there is no English word henge, Prof. Herouni has solved the mystery of the meaning of the name Stonehenge, with a linguistic connection that reinforces the intuitive meaning, that these stones speak (i.e., teach us) about the nature of the cosmos. * Arman, Armen, Armenia, Yan, Aryan, and Caucasian: Herouni points out that Ar, the main god of ancient Armenia, the sun god, is the primary Armenian root and is the prefix to fully three percent of Armenian words, and that Arman means man of the sun, Armen means men of the sun, and Armenia (with the ia suffix in the ancient language) meaning land of the Sun. Regarding the term Aryan, Herouni goes back further than the traditional etymology (Sanskrit/Iran), to suggest the derivation of Ar and yan. Yan, also ian, is the typical suffix for Armenian names such as Petrosian, Galoyan, Vartanian. Thus Aryan would mean "from the Sun land", referring to those descended physically or even culturally from Armenia. Caucasians is a more recent term and not used technically today for whites, adopted to refer to those originating from the Caucasus Mountains. (The Major Caucasus Mountains run just north of Armenia and the Lesser Caucasus Mountains run through Armenia.) Finally, there is much more to Armenia's role in the development of civilization than scholarship has recognized. And with the mountains of Ararat in Armenia's backyard, don't expect a forthright investigation of the matter. 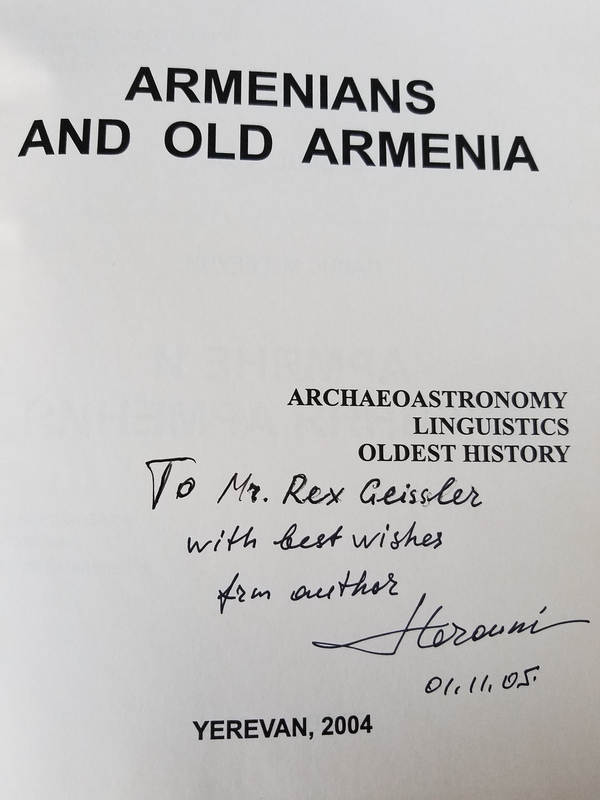 So, while Paris Herouni is an old-earth secularist, Real Science Radio highly recommends his book, Armenians and Old Armenia! * Incidentally, Ever Wonder Why the Names of So Many Lands End in a or ia? See rsr.org/raqia#ia. * Incidentally, Armenian Translation Helps Save Ancient Chronologies: The Story of the Armenian Translation of the Eusebius' Chronological Tables provides a glimpse into one of the ways in which ancient history has been preserved. * On the Muslim Genocide of 1.5 Million Christian Armenians: Hear Bob Enyart's broadcasts for the anniversary of the 20th-century Turkish atrocity here and here. * 1800-Year-Old Roman Dodecahedron: According to Wikipedia, "A Roman dodecahedron is a small hollow object made of bronze or stone, with a dodecahedral shape: twelve flat pentagonal faces, each face having a circular hole of varying diameter in the middle, the holes connecting to the hollow center. 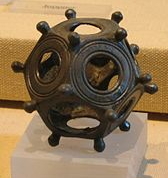 Roman dodecahedra date from the 2nd or 3rd centuries CE. ... Smaller dodecahedra with the same features (holes and knobs) and made from gold have been found in South-East Asia..."
* Oh Yeah, And How Do You Depict Thought? Artists can find abstractions, like say predestination (about which the Jerusalem Post illustrated an article with our BEL artwork), challenging to depict. 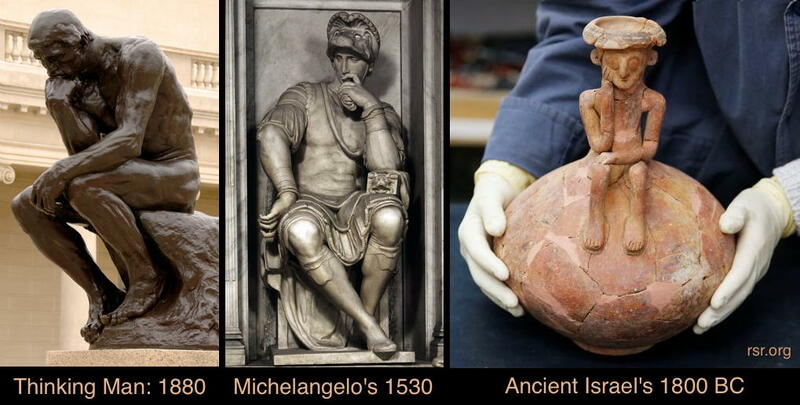 Yet from nearly 4000 years ago, back in the time of Israel's patriarchs and before their sojourn in Egypt, men crafted artwork to depict intangibles, including that of thoughtfulness. * Scholar Emmeline Mary Plunket, 1893: "We should also be led to think of the common ancestors of the civilized races not as ignorant barbarians, but rather as men graced with high intellectual gifts—men whose teachings have been handed down through all the ages to this present day, and of whose imaginings the Zodiac remains as the most ancient monument of the work of intelligent man." Reprinted in 1903, pp. 42-43, in her Ancient Calendars and Constellations. And regarding the ancient world's brilliant calendars, see 360dayyear.com. * And finally, it's even the dogs: From Science: "humans mastered the art of training and controlling dogs thousands of years earlier than previously thought." Today's Resource: Get this book, The Genius of Ancient Man — Evolution's Nightmare by Don Landis, president of Jackson Hole Bible College, along with other great creation resources at AiG's online bookstore and check out the fascinating Genius of Ancient Man blog by Don Landis and other researchers.